Before he became the first African-American to serve on the Supreme Court, and before he successfully argued a landmark civil rights case in Brown v. Board of Education, Thurgood Marshall (Chadwick Boseman) was the founder and executive director of the NAACP Legal Defense Fund, traveling the countryside and defending black clients who had been falsely accused of crimes based solely on the color of their skin. One such case, practically a footnote in his storied legal career, is explored in Reginald Hudlin’s Marshall. The year is 1941, and Joseph Spell (Sterling K. Brown) has been charged with the sexual assault of a wealthy socialite (Kate Hudson) for whom he chauffeured. With racism permeating nearly every corner of the community, Marshall finds himself unable to mount an adequate defense when a cantankerous judge (James Cromwell) bans him from speaking in the courtroom because he’s not a member of the Connecticut bar, leaving him to rely on the efforts of an inexperienced insurance lawyer named Sam Friedman (Josh Gad) who finds himself stuck with a case he never wanted. “I can’t get involved with a case like this,” he tells Marshall. “I have a reputation to think of.” But Sam’s reputation is the least of Marshall’s worries – he’s far more concerned with a judicial system that seems as though it has been specifically constructed to prevent a black man from receiving a fair trial, including an unfavorable jury pool, falsified evidence and constantly changing witness testimony – not to mention a prosecutor (Dan Stevens) more concerned with winning the case than actually getting to the truth of the matter. 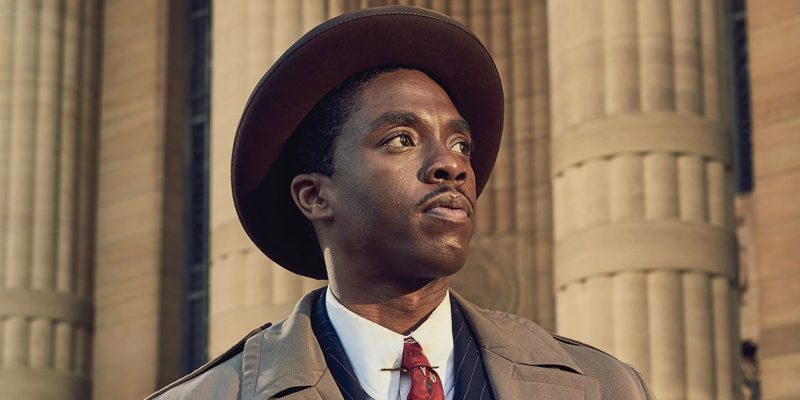 With a tilted fedora and a confident smirk, Boseman infuses the role of Thurgood Marshall with a notable amount of swagger and style, complemented perfectly by Gad’s earnest portrayal of a guy so nice that “if you dropped a nickel while kicking him in the balls, he’d pick it up and hand it back to you.” As a Jewish man familiar with another kind of prejudice, Sam feels a certain empathy toward his client, and Gad brilliantly taps into this in the most subtle of ways. Stevens is appropriately despicable as the villain of the piece, and Cromwell glowers and grumbles his way through the film to great effect. Working from the tried-and-true formula of nearly all courtroom thrillers – expect lots of gavel-banging, heated objections from opposing counsel, and closing arguments that border on ostentatious – Marshall does little in the way of reinventing or revitalizing the genre. Its punchy score often seems like an odd match for the severity of the subject matter, and it’s nearly bereft of any real surprises or tension, but it remains nonetheless entertaining while affording Boseman another opportunity to showcase his considerable range, and add yet another prominent name to the list of black historical figures he’s portrayed onscreen.